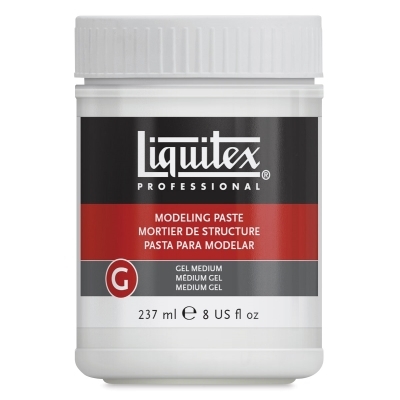 This extra high viscosity paste is made from marble dust and 100% polymer emulsion. Suitable for building heavy textures on rigid supports and three-dimensional forms, it dries to the hardness of stone. It can be textured while wet and sanded or carved when dry. Dry paste out in the container for use as clay. Drying too quickly on surfaces causes cosmetic, not structural, cracking. Modeling paste adheres to any non-oily, absorbent surface. When it is mixed with acrylic colors, it acts as a weak tinting white while increasing thickness and rigidity. Used extensively for decorating picture frames, it can be used for sculptural or paper-mache purposes, rigid support, flexible support, and as an absorbent or non-absorbent ground.